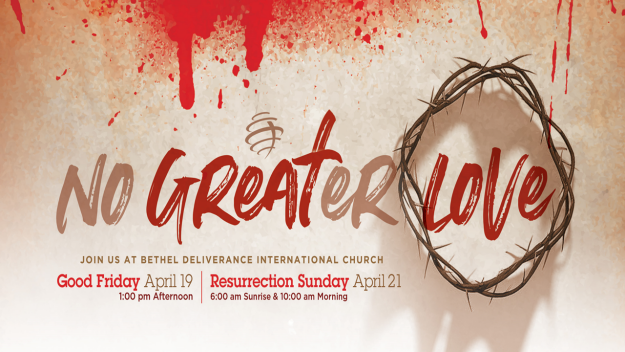 Join Bethel Deliverance International Church for our Resurrection Day services. On Friday we will observe Our Savior’s sacrifice on the cross during our Good Friday service, on Friday, April 19th at 1:00 pm. On Sunday, April 21st we will celebrate Christ’s Resurrection during our two Resurrection Day services at 6:00 am and 10:00 am. All services will be held at Bethel Deliverance International Church located at 2929 W. Cheltenham Avenue, Wyncote, PA 19095. Come and bring the whole family as we celebrate the death, burial and resurrection of our Lord and Savior Jesus Christ.